This year is the centenary of the Royal Air Force (RAF), which was the first independent air force. 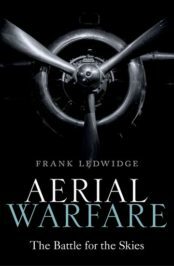 Before I started writing Aerial Warfare, I would have assumed the answer to the question, ‘what was the first air arm?’ to be an early 20th century affair, armed with rickety biplanes. In fact, the first air arm was the French Aerostatic Corps of the Revolutionary Wars of the 1790s. They were commissioned in 1794, fought through the campaigns in what is now Belgium and the Netherlands, as well as parts of Germany. They were disbanded after the somewhat abortive Egypt campaign in 1799. In their first battle the 25 men of the Corps were ‘volunteered’ by their remarkable commander, Jean-Marie Coutelle, to take part in an attack on a well-defended Austrian position in early 1794: ‘We had only two casualties- one serious. But we had proved ourselves as soldiers’. 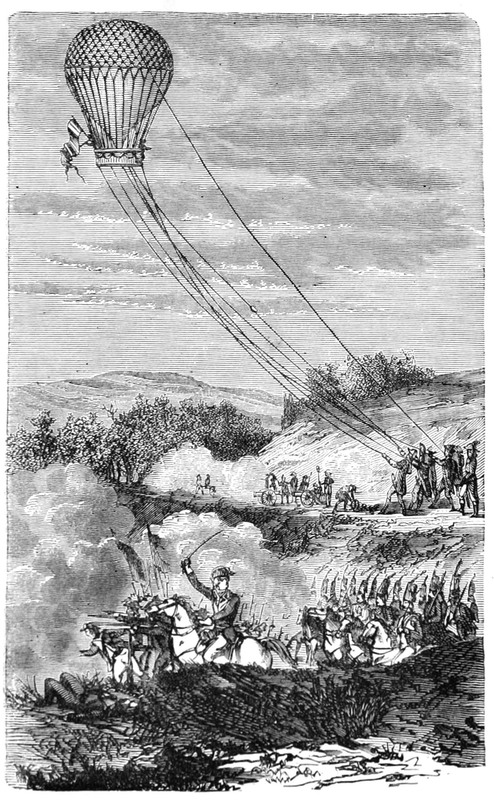 A few months later at the Battle of Fluerus on 26 June 1794, Coutelle soared over the battlefield suspended beneath the world’s first combat aircraft, the hydrogen balloon ‘L’Intrepide’. For the nine hours of the battle he observed enemy positions and sent regular messages sliding down the cables holding the balloon to the ground. The French Aerostatic Corps with their ‘L’Intrepide’ at Fleurus 1794. Image credit: via Wikimedia Commons. Whilst the contribution of the Corps was probably not decisive, it was important enough for the commanding General to have the balloon included in his army’s official letterhead. These were intrepid men, scientists at the forefront of their field, and as it turned out rather brave troops. This is if not a unique combination, certainly rather rare, and I can think of no other combat unit in modern military history that mixed the skills of cutting edge science with front-line service. Their story also casts light on a somewhat wider matter. The technology they deployed was new, it was very difficult both technically and logistically to deploy. However, when it was deployed properly it allowed commanders an entirely new perspective of the battlefield. It was clear to very many officers that this was, whilst not perhaps a war-winning technology, it had not only demonstrated very great potential, but had to some extent fulfilled it. The true potential for aircraft as a war-winning weapon began to be realized in the First World War. At the First Battle of the Marne in 1914, Corporal Breguet of the French Army spotted the manoeuvres of the main German army rapidly approaching Paris. His information was received in the nick of time and allowed allied commanders to alter the plans to ensure the Germans were stopped almost within gun-range of the French capital; this was the ‘Miracle on the Marne’. Throughout WWI It was in the role of observers for the heavy guns of the artillery – bringing or later in the war, sending messages on the positions of enemy forces by radio – that aircraft were particularly effective. When infantrymen saw enemy planes above them, they realized that enemy shells were likely to follow very quickly. Clearly it was in the interests of the other side to ensure that such ‘reconnaissance’ aircraft were stopped; and so the ‘fighter’ aircraft was born. Similarly it didn’t take long for the potential for ‘bombing’ aircraft also to be realised, although the first efforts of bombers in WWI, both on the battlefield, and far behind the lines against civilians in the so-called ‘strategic’ bombing role were not impressive. By the time of the Second World War, air power had proved its worth as a military weapon in several conflicts, notably the Spanish Civil War (1936-1939). Its military potential was initially best exploited by the new German air force, the Luftwaffe, although allied air forces, learned very quickly. Allied might ground down German air power, giving the RAF and US Army Air Corps ‘control of the air’ over Germany. Dozens of smashed cities and hundreds of thousands of dead civilians bore testimony to what bombing from aircraft could do. The degree to which that destruction contributed to allied victory was and remains a matter of intense controversy. 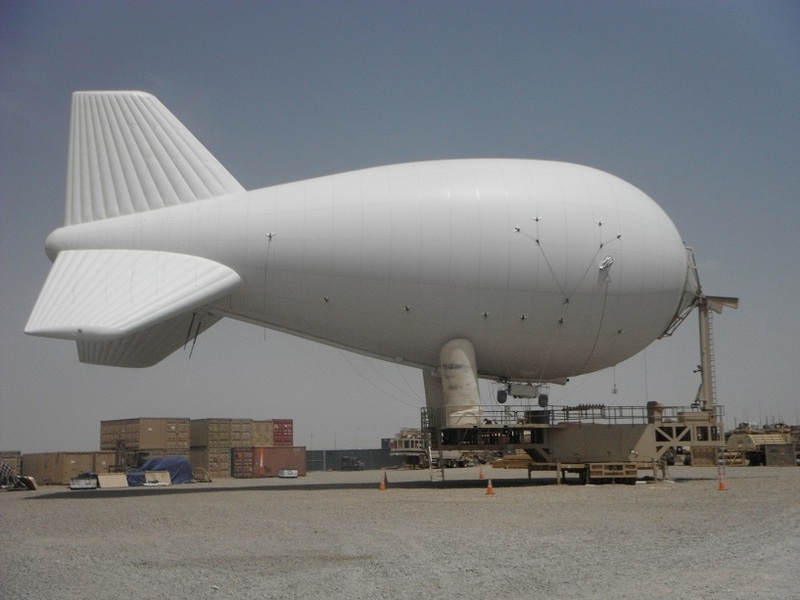 An aerostat in Afghanistan 2014. Image credit: Mcgyver2k via Wikimedia Commons. The Cold War saw hundreds of billions of dollars flowing into aircraft development and construction. Aside from Vietnam and many ‘small wars’ (none of them ‘small’ to their participants) these vast arsenals of ever-more advanced and expensive weaponry merely glowered at each other. This century saw aircraft, especially helicopters and bombers or ‘strike’ aircraft as they are now called brought into the various ‘9/11 Wars’. Once again, the jury is out as to their strategic as opposed to tactical or battlefield effectiveness. It might be worth ending this brief survey of the history of air power by going, as it were, back to the future. Today gas balloons (filled now by helium), tethered to the ground and packed full of sensors, stand guard over US bases in Afghanistan and Iraq. Like Coutelle and his ‘aerostiers’ in the 1790s, their operators use these aircraft to observe enemy movements and positions. In air power, as in so many matters, the more things change, the more they stay the same. Whether the future of air power is manned, or as many believe, unmanned is not clear. What is obvious is that control of the air will depend of mastery of the ‘ones and zeros’ plying up and down the various data links connecting the various airframes. This in turn will require those at the forefront of contemporary technology to be deeply involved in the business of air power; just as in 1794. The name of the battle referred to in article was ‘Fleurus’ … a simple typo, but glaring nonetheless.